"Here, contact Rawalwasia," our friend told the stressed man. "They'll help you." "Rah-wal-wah-see-uh" our friend repeated, slowly this time. "Forget it, just call 'em Crane Dude." And that's really how it's gone - again and again. We’ve been fortunate to make many friends in the crane industry. In them we see integrity, a strong work ethic, generosity...we see people we want to call our friends. So we leveraged our international understanding and experience to put our focus on cranes. Crane Dude believes you need a friend in the crane market. Because we build relationships with our clients, we are known and trusted in the heavy equipment industry. This is our purpose, mission, and vision. Simple. We treat you like we would want to be treated ourselves. We have a saying at Crane Dude, "Buy what you need, sell what you don't." We will work with you every step of the way to ensure a smooth transition. We will listen to fully understand your equipment needs. Next, we will dedicate our time to finding the right crane for you. After the sale, we will continue to follow up with you to make sure you are happy. 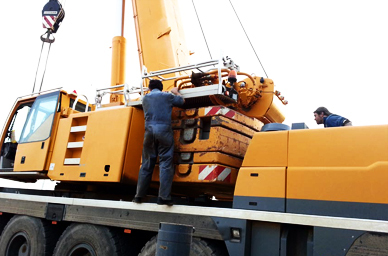 In 2003 Rawalwasia group was launched with one purpose: to be the best value in full-service crane sales. Since then we have built hundreds of relationships, continued to provide yard to yard service, and stand by our customers after the sale. Crane Dude knows cranes. We help our friends make educated crane purchases. What we don't yet know is how we can serve you. Call us today - we're ready to listen.